When I moved recently to Oak Park, Illinois with my family, I was surprised and delighted to discover that this Chicago suburb with its modest Jewish community is a veritable oasis of Yiddish-oriented curiosity and cultural activity, centered around the activities of a passionate cultural activist. In 1992, Mike Bass was serving as the chairperson of the adult education committee of Oak Park’s Reform synagogue, Oak Park Temple, when the committee decided to present a program about Yiddish lullabies. 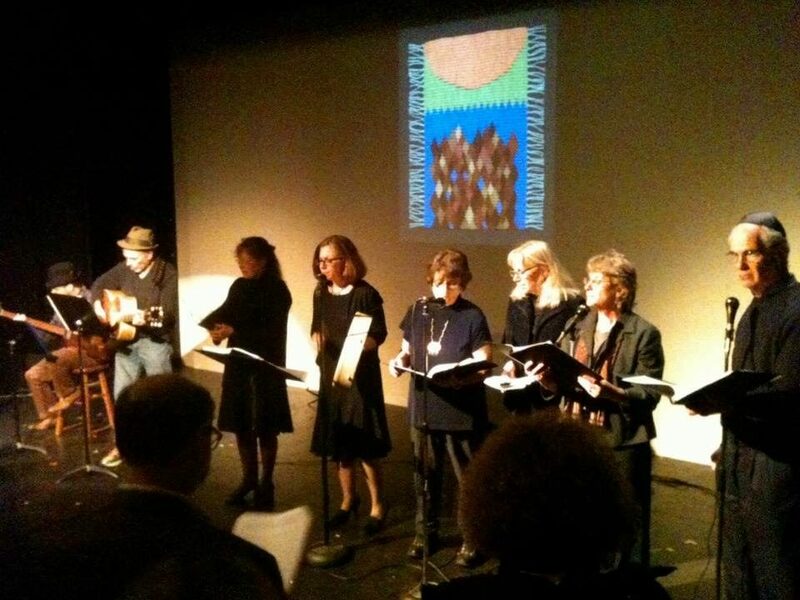 This modest beginning inspired interest that eventually grew into a Yiddish singing group, MameLoshn, with about a dozen members who meet regularly to sing in Yiddish and who perform to local audiences. Among their events is an annual Hannukah concert at the Buzz Cafe in Oak Park, a Yom Hashoah performance, and renditions of sermonic songs written or inspired by Rabbi Levi Yitzchok of Berditchev, which the group sings during High Holiday services at Oak Park Temple. 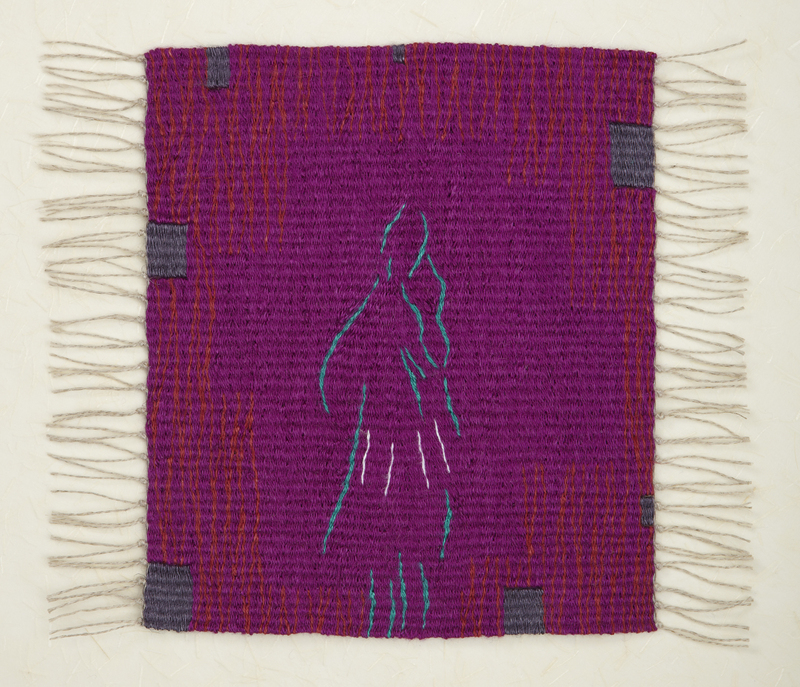 This year, Berit Engen, a member of the MameLoshn group and a textile artist (see her work here), displayed tapestries she created inspired by “A Din Toire Mit Got,” which Bass performed at second-day Rosh Hashanah services. 1 1 Lilith magazine profiled Engen and published some of her work here. I was there, attending the Rosh Hashanah services, and was deeply moved as Bass shared the Berditchever Rebbe’s words not as a historical artifact but as an authentic part of the liturgical body to be wrestled with on the days of solemn reflection. He spoke about his interpretation of the text as one that addresses moments of political uncertainty and vulnerability and bravely, even audaciously demands God’s attention to the troubles of the world. 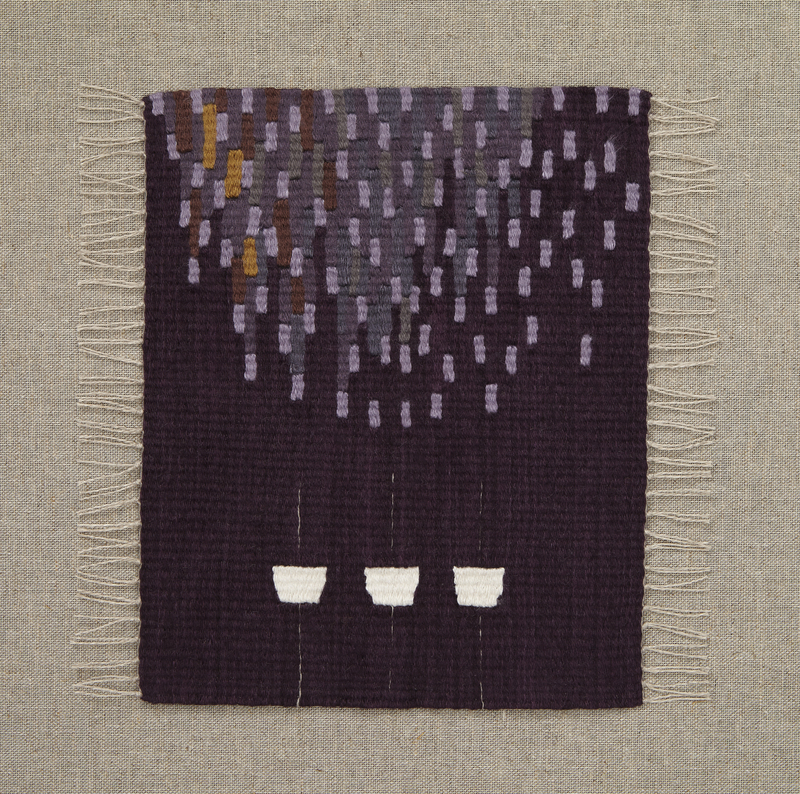 Berit Engen addressed the congregation, explaining that her series of tapestries, “A DIN TOIRE MIT GOT – Hey God, FYI, it is not pretty down here right now” depicts a bleak world in which hope glimmers only in the far distance. Her tapestries, like Rabbi Levi Yitzchok of Berditchev’s prayer, demand that God not turn away. Bass sang, and then as his performance closed, the congregation, seated in the round near large windows, watched the sun rise as we opened our new Reform machzors and began to pray. Mike Bass performs “A Din Toire Mit Got,” accompanied by Terry Tennes. 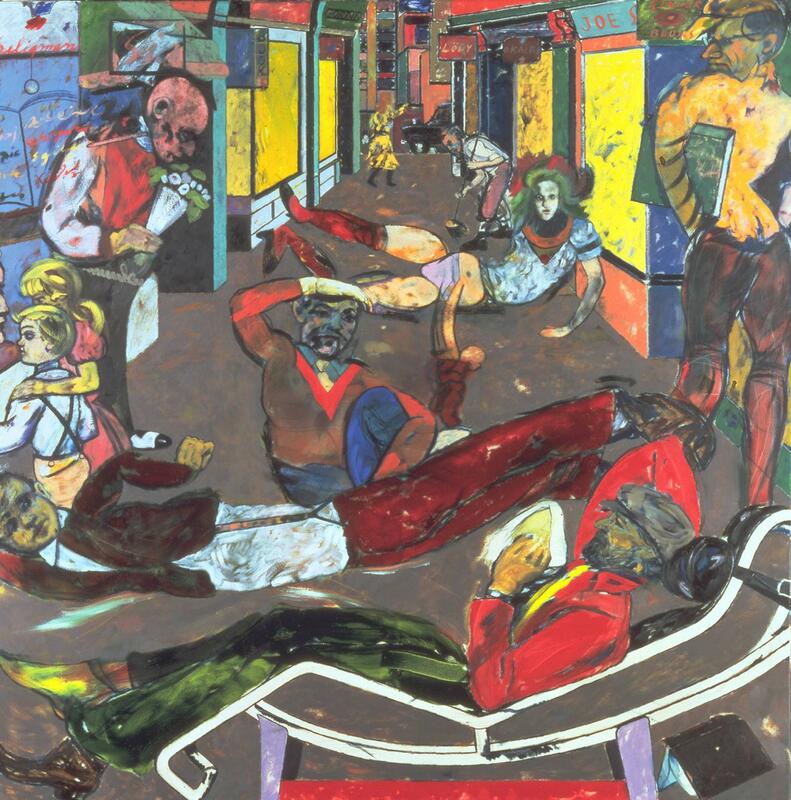 In 2014, Bass discovered the Yiddish Book Center’s annotated list of the 100 Greatest Works of Modern Jewish Literature. He found a group of friends who were regular attendees of synagogue adult education initiatives, and invited them to read through the list with him. They began with whichever of the books on the list could be found in the Oak Park Temple Library. 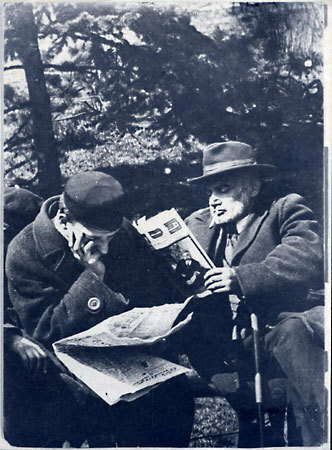 After reading classic works by Sholem Aleichem, Mendele Mocher Sforim, and Y. L. Peretz, the group expressed a thirst for reading more Yiddish in translation and has evolved into a Yiddish reading group. They meet once a month over lunch to discuss literature and maintain a list of books they have read and intend to read, as well as minutes that detail the contents of their conversation. In addition to their weekly meetings, the group often gathers to attend local theater productions related to Yiddish or Jewish culture and have traveled together to Montreal and New York. Last month on a shabes afternoon I was ushered into a book-lined dining room where guests made friendly conversation over homemade bagels, coffee, and lentil soup. As the group settled in, the host called us to attention, asking us what we thought of the book, Ellen Cassedy and Yermiyahu Aaron Taub’s translation of a collection of stories by Blume Lempel, Oedipus in Brooklyn. 2 2In geveb published a story from the collection, “The Debt,” as well as a teaching guide to the story and a reader’s reflection about it. Our far-ranging conversation brought us to issues of trauma and memory, the indifference of nature, and the way that women in the stories feel the need to yield to the desires of men. An hour later we found ourselves emotionally exhausted but eager for more, and we planned to discuss the book further at our next meeting. When Mike Bass mentioned to the Yiddish book group that I would be interviewing him for In geveb, we had a long conversation about the role of Yiddish in the Oak Park Jewish community. There were those who, when they first heard Bass perform in Yiddish, felt frustrated by their associations with Yiddish as something passé and irrelevant. As they’ve moved deeper into studying Yiddish literary production they’ve come to see Yiddish literature as something that speaks to them, sometimes with a voice of urgency and immediacy that stretches across time and place. Reform Jewish communities are not places in which one might expect to find a robust engagement with Yiddish culture. 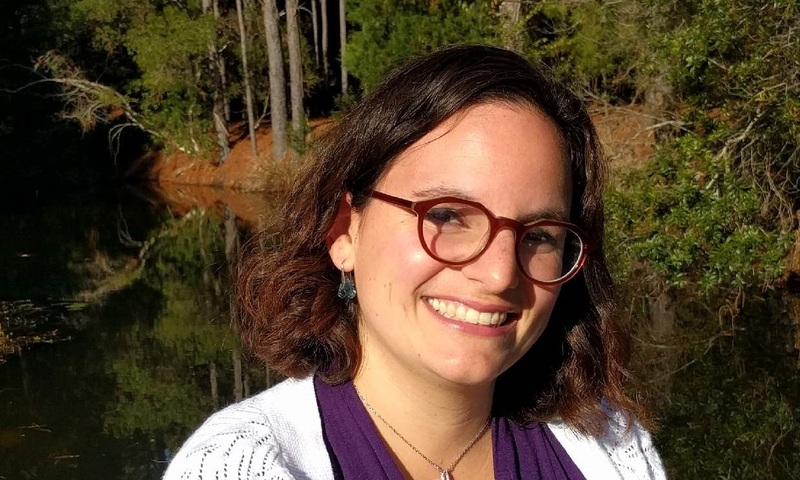 Reform Judaism in America historically grew out of and had affinities to German Jewish traditions and cultures, and sociolinguist Sarah Bunin Benor has noted the ways that Israeli Hebrew has become adopted as a contemporary Reform Jewish language of prayer and community. 3 3 Benor, Sarah Bunin. 2013. “From Sabbath to Shabbat: Changing language of Reform sisterhood leaders, 1913-2012.” In Sisterhood: A Centennial History of Women of Reform Judaism, ed. Carole B. Balin, Dana Herman, Jonathan D. Sarna, and Gary P. Zola. Cincinnati: American Jewish Archives. Hebrew Union College Press, 2013, pp. 314-337. In my own experience as an active member of Reform Jewish communities (my husband is a Reform rabbi, currently serving as the assistant rabbi of Oak Park Temple) I have often noticed Yiddish referred to with affection combined with rejection, the way one might speak of a favorite garment long outgrown. I often find myself experiencing a deep divide between my Jewish life as an active and dedicated member of Reform Jewish communities and my Yiddish life as an academic, a translator, teacher and reader of Yiddish. In the rare moments when the two intersect, I feel a sense of relief, belonging, and homecoming. 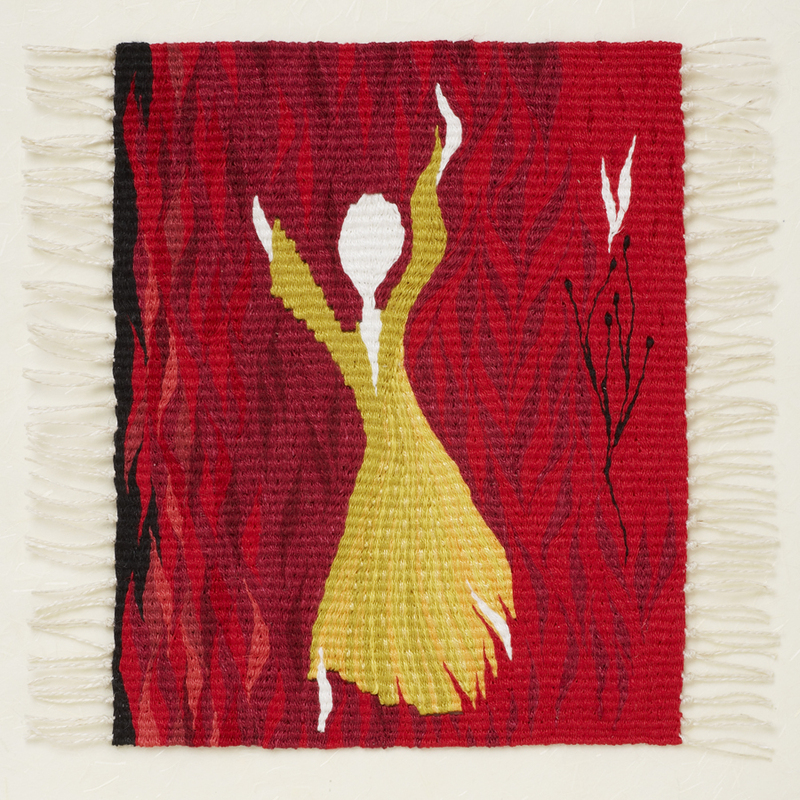 I spoke to Mike Bass and Berit Engen about their Yiddish activities and their relationships to the language, and am grateful to them for sharing their reflections, and to Engen for sharing images of her tapestries. 4 4 Berit Engen’s tapestries are copyright registered and these images are authorized for use in this article only. Please do not further reproduce them without contacting the artist for permission. Jessica Kirzane: How did you each come to be involved with Yiddish? Mike Bass: I was aware of, and heard, Yiddish since childhood. My father learned Yiddish from his immigrant parents. His father spoke five to six languages, and his mother only spoke Yiddish though she lived in the United States over forty years. My mother’s immigrant grandparents spoke Yiddish and my mother learned the language by helping her grandmother prepare for shabes. My parents kept secrets from their children by speaking Yiddish. I began learning Yiddish in earnest as an adult. My journey to learning Yiddish included a language course we sponsored at Oak Park Temple with Dr. Khane-Faygl Turtletaub. About the same time our adult education committee sponsored a program to teach Yiddish lullabies led by Phyllis Kupperman accompanied by Ben Stark [both current MameLoshn members]. In her teen years, Phyllis had been a song leader at Kamp Kinderland, a Workmen’s Circle Camp in Michigan. We asked people to sign up if they were interested in learning more songs on a monthly basis. Since 1992 our group MameLoshn has been meeting monthly to sing and learn Yiddish songs. Mostly we use the Pearls of Yiddish Song books compiled by Joseph and Chana Mlotek. The last three years I have attended the month long Yiddish Summer Institute held at Vilnius University. I also take the online course sponsored by Workmen’s Circle in fall and spring. Berit Engen: I saw a note in our monthly bulletin from and about MameLoshn. Anyone could join: one did not have to know Yiddish, and one did not have to know how to sing—one just had to bring a Yiddish song to share and show up for the monthly sing-a-long. I looked at this note every month for about half a year, and finally, with a song in hand, I dared showing up. I was not Jewish, but I had realized that I could understand quite a bit of Yiddish because I had studied German in school, and many words are also similar to my native language, Norwegian. I like to sing, but I find it extremely challenging to sing in groups - here that did not seem to be a problem. The members were fun, warm and welcoming, and the songs were, to my Northern and Bergmanesque delight, in minor keys. Needless to say, the song I brought, “Rozhinkes mit mandeln,” was “old” to everyone else, but it didn’t matter: I had learned and fallen in love with it a few years earlier, listening to a Pete Seeger lullaby record. Now I was nine months pregnant, I was nervous, and I wanted to do something nice for myself: with a one-song repertoire I chose to join, and was accepted into, MameLoshn. Although it was through singing I got involved, I am a hobby linguist, so the language itself is of great interest to me, and, naturally, the history that comes with it. A couple of years later (around 1998) I took the initiative to create our Yom Hashoah program which we have presented every year since. I used books and recordings to research the songs and different performances. Not only did we practice for months, but we approached the material in a challenging way for us. Since so many of the songs were made by the victims during the war and told individual stories, they demanded a different way of singing, namely that we would sing solos and in smaller groups. Sixty people came to see this three-hour long program! I had invited a few artists at the temple to paint twelve eight feet tall and three feet wide panels which we used as background/enclosure. The artwork was striking and added another dimension. With this event we went from being a fun and freylekh group to one whose serious repertoire gave voice to those who perished and honored survivors. That was twenty years ago. Now we are a smaller group and our program is shorter. For artwork we now use my tapestries projected on the wall behind us. They frame the program. I love presenting my tapestries in such meaningful setting. JK: When I heard you sing at Rosh Hashanah services, Mike, I was very surprised about the repertoire. 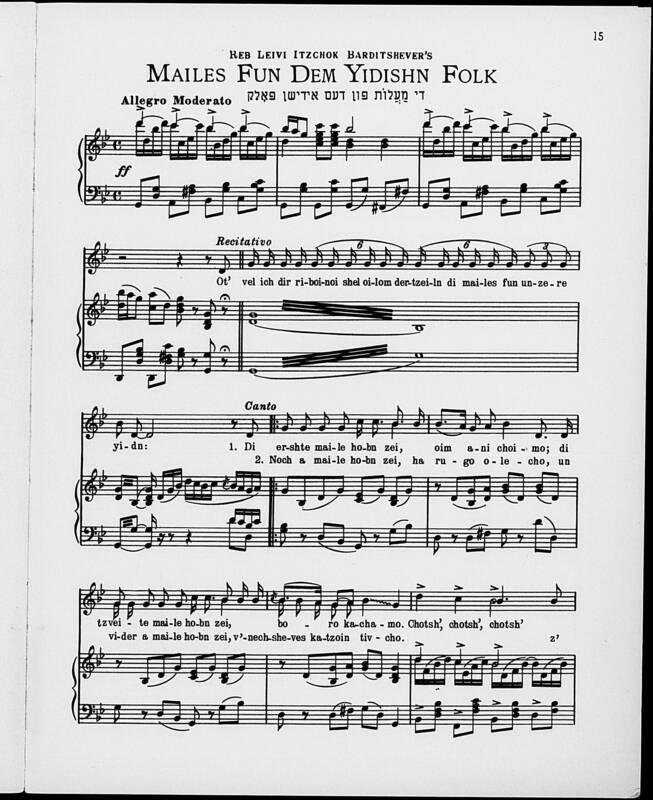 Somehow I was expecting more widely known Yiddish folk songs and was taken aback by the starkness and liturgical relevance of the piece you chose, “A Din Toire Mit Got.” Can you tell me where you found the piece? MB: MameLoshn got early funding from a grant through the Community Foundation for Jewish Education to develop a Yiddish Holiday song curriculum at Oak Park Temple. We used the money to buy song books. The curriculum consisted of songs for Chanukah, Purim, Pesach and Yom HaShoah. We expanded our holiday repertoire to Simchat Torah and Tu b’Shvat. As I was searching for songs for the High Holidays, I found a rendition of “Kaddish” based upon “Din Toiro mit Gott” sung by Paul Robeson in English. 5 5 Jonathan Karp relates the complete story of Robeson’s performance of this piece in his article “Performing Black-Jewish Symbiosis: The “Hassidic Chant” of Paul Robeson.” American Jewish History 91, no. 1 (2003): 53-81. On a visit to the Yiddish Book Center, I found the Yiddish version of the sheet music. Then on a visit to YIVO in New York City, my wife Ilene chatted with the archivist in the library who had Yiddish music on his cart. He let me look at a collection of duplicates that I could have. One of the books I took home was a collection of songs with piano arrangements, Folks Gezangen arranged by Chaim Kotylansky. The book has a forward by Sholem Asch. 6 6 Kotylansky, Chaim. Folks-gezangen: A collection of Chasidic songs and chants, Yiddish-Ukranian folk songs and “Shteiger-Lieder”. Chaim Kotylansky Book Committee along with Folks-Farlag, Aveltlicher Yiddisher Kultur-Farband (YCUF), Los Angeles, CA, 1944. This book had five songs written or inspired by Rabbi Levi Yitzchok from Berditchev. Each of these songs were introduced as having been the Rabbi’s sermons during the High Holidays. It was for that reason I began learning one of the songs each year with the help of my piano teacher and accompanist Terry Tennes. Rabbi Max Weiss and Cantor Julie Yugend-Green suggested we present the song at Second Day Rosh HaShanah. The song was well received, so it became a tradition to sing one of the songs each subsequent year. When the series of five songs had been played, now in our seventh year, we presented “Din Toiro mit Gott” (Trial of God) which had been our first song. Pictured: a page from Kotylansky’s folk song collection. JK: How have the songs been received by the congregation? MB: Presenting these songs at Oak Park Temple has been very gratifying. They are a break from the liturgy of the Reform Prayerbook. They are a vehicle for introducing congregants to the Yiddish language. At first it seems strange and quaint, but with continued exposure, congregants have found deeper meanings in the songs. Hearing words created by a nineteenth-century rabbi for an Eastern European Chassidic shtetl congregation transcends time and space. Congregants hear this song on different levels. For some it is only the music, while others engage the history and personage of Rabbi Levi Yitzchak, others who know a little Yiddish relate to a word or phrase. What is impressive is that at a Reform Congregation in the Western Suburbs out of the mainstream of Chicago Jewish population, Yiddish is happening, and the songs of Rabbi Levi Yitzchak of Berdichev have become a staple for the Second Day Rosh HaShanah Service. 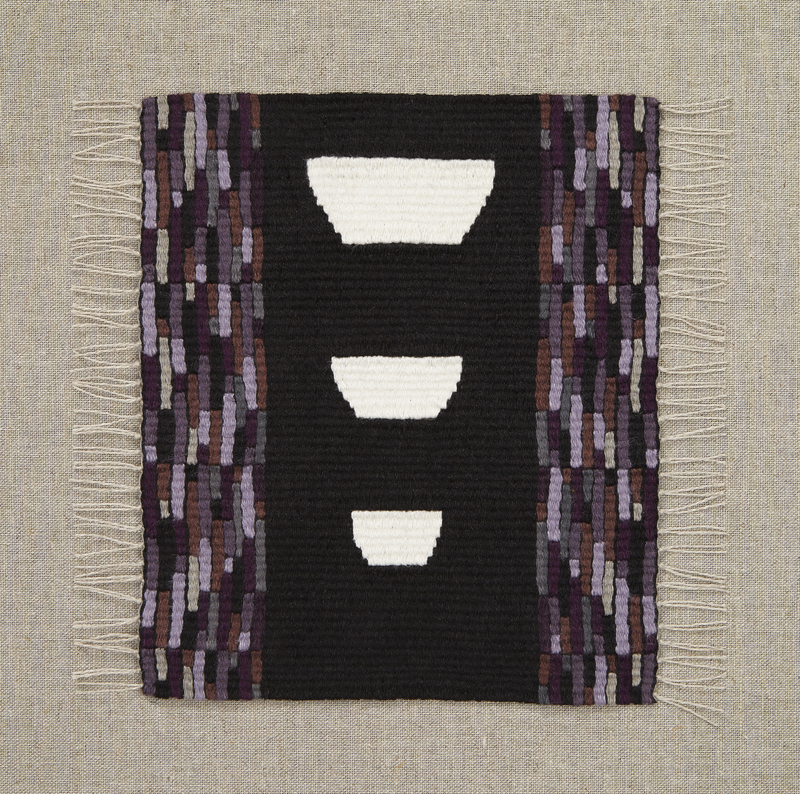 JK: Berit, what led you to weave Yiddish-inspired tapestries? BE: My Yiddish-inspired tapestries are part of my project, “Woof & D’rash - Weaving a Thousand Jewish Tapestries,” which I started in the fall of 2007. It is a collection of miniature tapestries; to date I have about five hundred. I weave full time, and I have another ten more years to weave various aspects of the Jewish experience, which I have become familiar with through rituals and study. My pace of production is somewhat limited by the time it takes to finish a tapestry, which is about five days. By the time I started my project, I had converted to Judaism. I had been singing in MameLoshn for about ten years, and when I decided to weave a series on the Holocaust, I chose to base it on the Yiddish songs from that time. 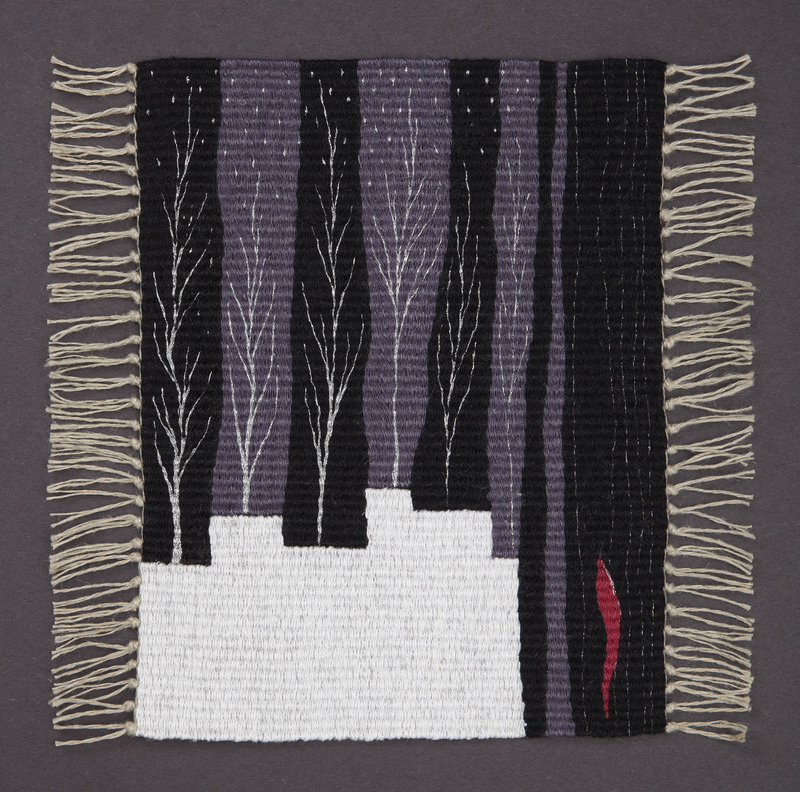 I also wove tapestries inspired by other Yiddish texts, such as wisdom sayings and curses. As much as I like to document the richness of Yiddish culture, my project is not a scholarly effort; I pick and choose from what comes my way and speaks to me. At the moment I am planning a few tapestries on short stories by Blume Lempel. I first became familiar with her stories through the book club organized by the Yiddish Book Center. But the underlying force in my choice of choosing Yiddish themes for my artwork is fourfold. First, I find the culture and the language fascinating. Second, as an immigrant, I can relate to the despair of seeing a culture dying when the language wilts. Cultural and emotional loss through losing a language is an experience most immigrants can relate to. It is so dramatic, yet there is so little drama around it - just a numbness, whether it is individual or collective. Ironically, as the pain lessens, more of the treasure one mourns has disappeared. Third, my Norwegian childhood experience of watching and listening to the Swedish TV production of Pippi Longstocking in original language planted in my guts the importance of knowing original language when exposed to a foreign literature and culture. It leaves a richness in me which I then can draw from. Last: I always feel elevated and inspired by melodies; I tend to like songs in minor - a feature of many Yiddish songs as well as in Norwegian folk music. It is thrilling to me when I find elements that connect with each other when trying to bridge my two backgrounds. Translation is so central to who I am—both what is lost, and what can be gained through studying or a good translation. I think of visual art as a way of translating in which I don’t have to be focused on accuracy of the text, but can take the impressions gathered and communicate them in a language of colors, shapes, and texture. My knowledge of Yiddish language, although limited, gives me that special lens. And that is an essential part of my joy of weaving in Yiddish. When we feel small, carrying more than our share. When my voice tries to reach You. While the branches of birch trees are often grey, the thin and straight trunks are white. Standing in the midst of a birch forest is like standing among long, white, silk stockings suspended from God’s clothesline. And watching the dance among trees is like watching the fiddler’s movements continuously appear and disappear. Half an arm, half a foot, in and out of view, like a dance behind bars. Prayer can be many things; one is an intimate and personal talk with God. We describe God in an ancient prayer as one who listens, shome’a. Thousands of niggunim were made – wordless songs to stir the soul and the heart, and hopefully also God’s ear. Such prayers often came from those without means to reach upwards through study, still desiring closeness with the Divine. “God protect us from goyishe hands and Jewish tongues!” (“Got zol op’hitn fun goyishe hent un yidishe reyd!”) No wonder this saying came into being, as the Yiddishe curses are often funny and intricately elaborate unfulfillable prophesies of doom. The Yiddishe words and sounds are such a perfect match with the sensibility of the outrage expressed; they make me giggle. “Zol vaksn tsibbelis fun pipek!” This curse might be damning in itself, but the English translation pales compared with the original Yiddish. In any case, being “adorned” with smelly onions when desire strikes is not an easy fate. “Play for me a little song in Yiddish!” Why state the language in which to play as if it were a national anthem? Maybe that is what a people without a homeland would do. Yiddish dancing was introduced in my synagogue by a member, one of the world’s leading klezmer dancers, Steven Lee Weintraub. He demonstrated to us its manageable sensuality and the possibility for subtle, individual devotion. And, important to me: I did not ruin it for the whole group should I, a dancing klutz, dance a step on a beat which wasn‘t there. This three-part series is structured around the Yiddish songs of the Holocaust. Many of them were written and composed by the victims during the war and as the atrocities unfolded. These songs, and others which fit their experience, were sung in that most hopeless of times by people awaiting their fate. A few were sung afterwards in the ruins, or later, in remembrance. If a sound from a war can linger, I think it must be through songs like these. According to the Tradition, birds carry our prayers to God. I think of these songs of the Shoah (especially the ones by or about children) as prayers of remembrance for the shive-foygl, the bird of mourning, to bring on her flight. The poet Hirsh Glick commemorates the first successful act of sabotage against the Nazi army in the Vilna region, accomplished by three young underground resistance fighters. Although it happened in summer, he sets the event in a cold and silent, starry winter night, giving a tender description of the single heroine, Vitka Kempner, who shoots at a German army convoy. The last line, “for our new, free generation,” expresses the partisans’ spirit of hope. But, in spite of youthful strength and courage, their generation dwindled as the war proceeded. Hirsh Glick perished in 1943, 23 years old. Lilith magazine profiled Engen and published some of her work here. In geveb published a story from the collection, “The Debt,” as well as a teaching guide to the story and a reader’s reflection about it. Benor, Sarah Bunin. 2013. "From Sabbath to Shabbat: Changing language of Reform sisterhood leaders, 1913-2012." In Sisterhood: A Centennial History of Women of Reform Judaism, ed. Carole B. Balin, Dana Herman, Jonathan D. Sarna, and Gary P. Zola. Cincinnati: American Jewish Archives. Hebrew Union College Press, 2013, pp. 314-337. 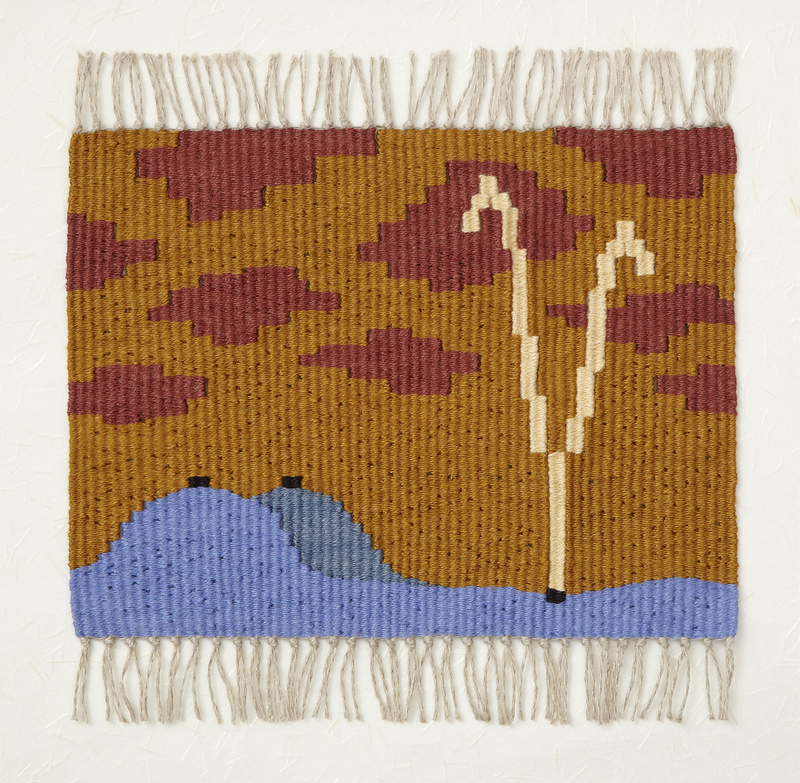 Berit Engen's tapestries are copyright registered and these images are authorized for use in this article only. Please do not further reproduce them without contacting the artist for permission. Jonathan Karp relates the complete story of Robeson's performance of this piece in his article "Performing Black-Jewish Symbiosis: The "Hassidic Chant" of Paul Robeson." American Jewish History 91, no. 1 (2003): 53-81. Kotylansky, Chaim. Folks-gezangen: A collection of Chasidic songs and chants, Yiddish-Ukranian folk songs and “Shteiger-Lieder". Chaim Kotylansky Book Committee along with Folks-Farlag, Aveltlicher Yiddisher Kultur-Farband (YCUF), Los Angeles, CA, 1944. Kirzane, Jessica. “Weaving in Yiddish: An Interview with Michael Bass and Berit Engen on Yiddish Community and Creativity in Oak Park, IL.” In geveb, October 2018: https://ingeveb.org/blog/weaving-in-yiddish-an-interview-with-michael-bass-and-berit-engen-on-yiddish-community-and-creativity-in-oak-park-il. Kirzane, Jessica. 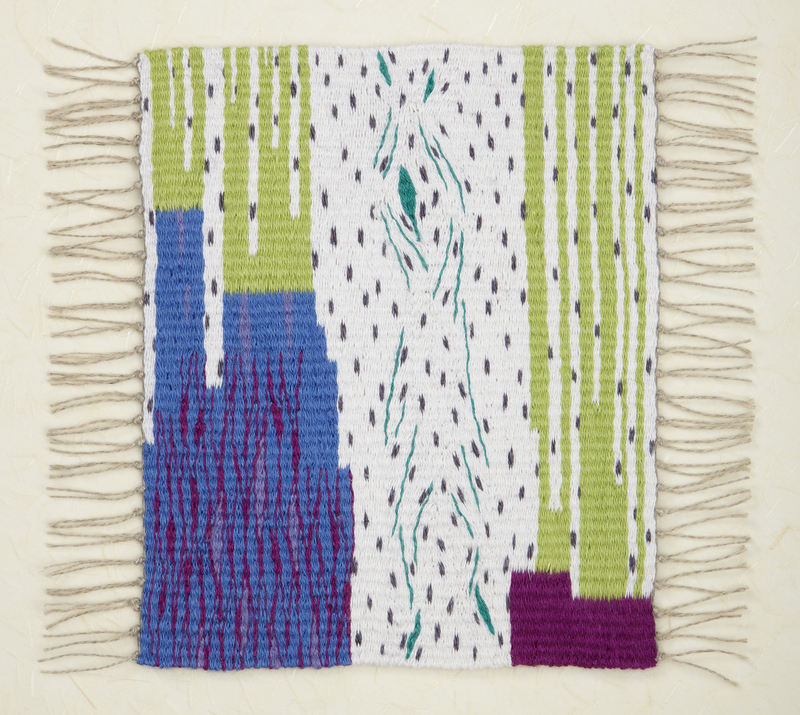 “Weaving in Yiddish: An Interview with Michael Bass and Berit Engen on Yiddish Community and Creativity in Oak Park, IL.” In geveb (October 2018): Accessed Apr 22, 2019.